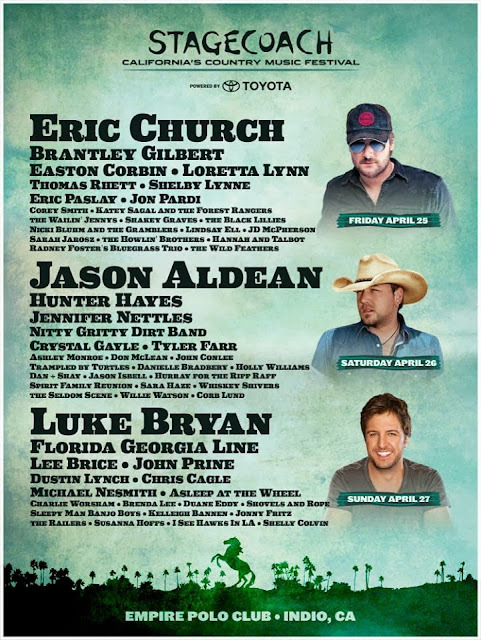 Lovin' Lyrics Music Promotions: STAGECOACH 2014 TICKETS ON SALE NOW! ERIC CHURCH, JASON ALDEAN, LUKE BRYAN AND TONS MORE ARTISTS TO PERFORM! STAGECOACH 2014 TICKETS ON SALE NOW! ERIC CHURCH, JASON ALDEAN, LUKE BRYAN AND TONS MORE ARTISTS TO PERFORM! Mark your calendars for April 25th and join fellow country fans at the 2014 Stagecoach Festival in Indio, California! Weekend passes go on sale this Friday at www.stagecoachfestival.com. Artists include headliners Eric Church, Jason Aldean and Luke Bryan with performances by many other great artists including Easton Corbin, Lee Brice, Hunter Hayes, Brantley Gilbert, Florida-Georgia Line, John Prine, Jon Pardi, Thomas Rhett, Shelby Lynne, Corey Smith, Jennifer Nettles, Nitty Gritty Dirt Band, Crystal Gayle, Tyler Farr, Ashley Monroe, John Conlee, Danielle Bradbery, Dan + Shay, Jason Isbell, Charlie Worsham, Loretta Lynn and more! Wow, this is gonna be a great time!